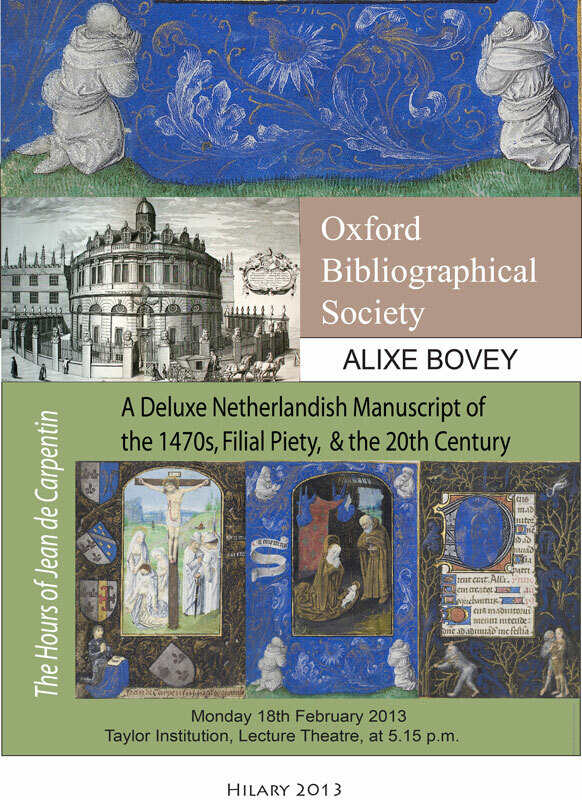 Dr Alixe Bovey has sent a message this morning to say, with deep regret, that owing to family misfortune she is unable to come to Oxford to give the lecture already announced for this evening (18 February 2013) on The Hours of Jean de Carpentin: A Deluxe Netherlandish Manuscript of the 1470s, Filial Piety, and the Twentieth Century. She deeply regrets whatever inconvenience this may have caused. Dr ALIXE BOVEY is a historian who specialises in the visual culture of the later Middle Ages. She began her career as a curator in the Department of Manuscripts at the British Library, working on a project that has evolved into the Catalogue of Illuminated Manuscripts, and she joined the University of Kent in 2005. Themes running through her work are pictorial narrative, word-image relations, the role of the visual arts in public ritual and private devotion, and the rhetorical and didactic functions of images. In 2008, she presented In Search of Medieval Britain, a six-part series for BBC4 that was broadcast as part of the channel’s Medieval Season. She has published on topics including literature, law, genealogy, medicine, devotion, and the liturgy, drawing especially in British, Netherlandish, French and Italian sources made between c. 1200-1500. Her most recent publication is the monograph Jean de Carpentin's Book of Hours: The Genius of the Master of the Dresden Prayer Book (Paul Holberton, 2011), which explores a remarkable yet little-known Netherlandish devotional manuscript of the early 1470s through its patronage, production, iconography, and controversial 20th-century provenance.